Habit: Plant < 3 m. Stem: trunks 1 to few, main branches spreading to curving upwards, few, generally short; terminal segments generally < 10 cm, 2--3 cm diam, firmly attached; tubercle 6--15 mm, < 8 mm high. Spines: 9--20, < 4 cm, pale gray to translucent yellow, sheath generally same color. Flower: inner perianth < 2.5 cm, yellow-green; filaments green to pale yellow. Fruit: dry, proximal tubercles +- = distal; base obtuse; spines dense distally. Seed: < 6 mm, generally fertile. Chromosomes: 2n=22. Unabridged Note: Although this sp. hybridizes with most co-occurring Cylindropuntia species, only a single sterile individual of putative Cylindropuntia echinocarpa × Cylindropuntia ramosissima is known. 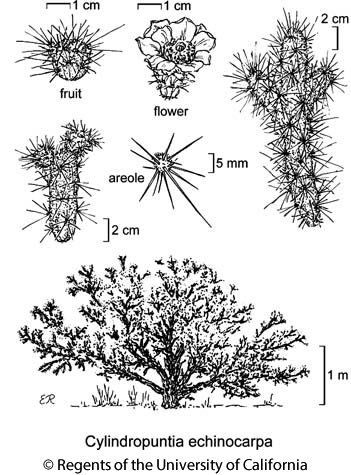 Citation for this treatment: Marc Baker, Bruce D. Parfitt & Jon Rebman 2014, Cylindropuntia echinocarpa, in Jepson Flora Project (eds.) Jepson eFlora, Revision 2, http://ucjeps.berkeley.edu/eflora/eflora_display.php?tid=80395, accessed on April 24, 2019.
s SNF, SNE, D; Markers link to CCH specimen records. Yellow markers indicate records that may provide evidence for eFlora range revision or may have georeferencing or identification issues. Purple markers indicate specimens collected from a garden, greenhouse, or other non-wild location.